Admission: Admission to palace grounds is free of charge, however you need to be aware of the fact that it is a private property. Admission to the palace is limited since it houses a restaurant. Czyżów Szlachecki is situated close to a border of Świętokrzyskie and Lubelskie Provinces. So as to arrive in there you ought to from Zawichost drive down the road no 777 towards Lublin and after a while turn left towards the road no 755. Driving straight ahead further on you approach Czyżów Szlachecki, where directly opposite to the church runs a main road at sharp curve to the right. At this point you have to turn into the third side street to the left and head for the palace. Its entrance is on the left side beyond the bridge. First references to the castle in Czyżów originate from the XVth cent. when its owner was a castellan of Sandomierz, Michał Ligęza of Półkozice coat of arms.As Jan Długosz claims in his chronicles, Michał Ligęza gained building material for the castle in Czyżów from disassembly of a church as well as a cloister in Zawichost. At the start of the XVIth cent. 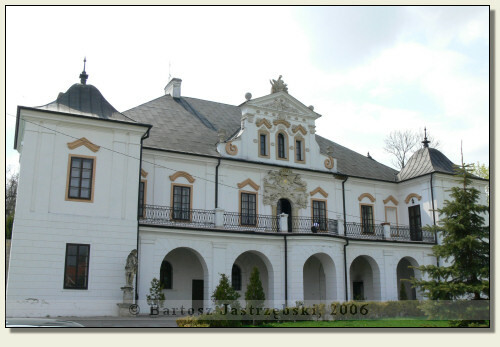 the castle came into hands of Zaklik house, who were the owners of Czyżów through the next 250 years. The castle was demolished during the Swedish Deluge. Currently existing palace came into being in the years of 1740-1750 in the place of the castle. It was then rebuilt in the XIXth and XXth cent. At the end of World War II the palace was used by Germans as a hospital. After the war it was looted by Soviet armies and in 1996 became a private property.